Tune noted at Lyne, near Horsham, Sussex, by L. E. Broadwood, 1880 and 1881. Source: Journal of the Folk Song Society, Vol. 2, Issue 7, #30, p. 128. Unto this Virgin said, unto this Virgin said. Our Saviour for to be. And crownéd with the thorns. God bless our house, your children too. The Lord will increase you day by day. "From Mr. A Glaysher, Cumber's Farm, Trotton, Rogale, Sussex, who heard it sung "over forty years ago," [e.g., 1840] and in writing says that it is called 'Richous Joes.'" Additional versions follow on subsequent pages. They will be added either here (if a single verse) or to their own page (if more than one verse). Please check back. And then "Christmas Mummers' Carol II. Second Version," beginning "God bless the master of this house." Six verses. L. E. Broadwood is Lucy E. Broadwood, niece of the noted collector Rev. John Broadwood. 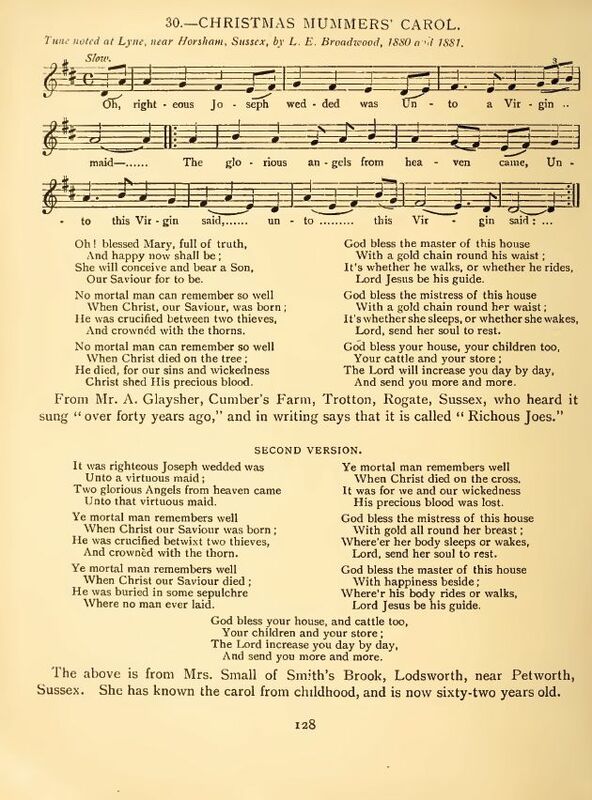 Uncle and niece collaborated on Sussex Songs (Popular Songs of Sussex). (London: Stanley Lucas, Weber & Co., 1890). This is one song in a large body of related songs that begins "When righteous Joseph wedded was." On the web site, there are two related songs with similar titles, both collected by Lucy Broadwood. Sung by Mummers, called in Sussex “Tipteerers,” after their play of St. George, the Turk and the Seven Champions of Christendom. Words put into shape from two very illiterate versions written down from memory by two of the actors. Editor's Note: There was another version of the same song on the same page, but without mention of a source. Sung by Mummers from the neighbourhood of Horsham about 1878 —1881. 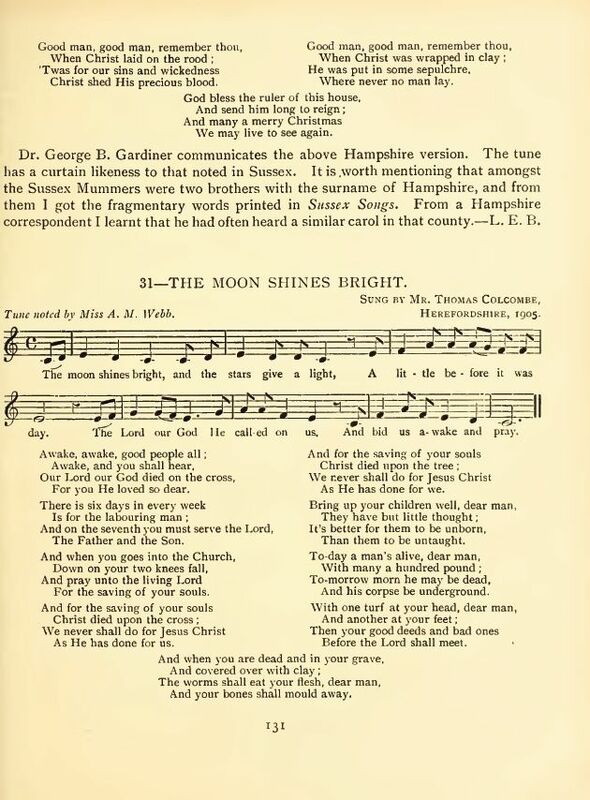 This very beautiful carol was sung several years in succession by Christmas Mummers, also called in Sussex “Tipteers” or “Tipteerers,” a name still unexplained in our dialect dictionaries. It was noted in 1880 and 1881, after which the Mummers ceased to act in the neighbourhood of Horsham. They clustered together, wooden swords in hand, at the close of their play “St. George and the Turk,” and sang, wholly unconscious of the contrast between the solemnity of the carol and the grotesqueness of their appearance, for they wore dresses of coloured calico, and old “chimney-pot” hats, heavily trimmed with shreds of ribbon, gaudy paper fringes and odd ornaments. Two actors in 1881 provided a few verses in very corrupted form. 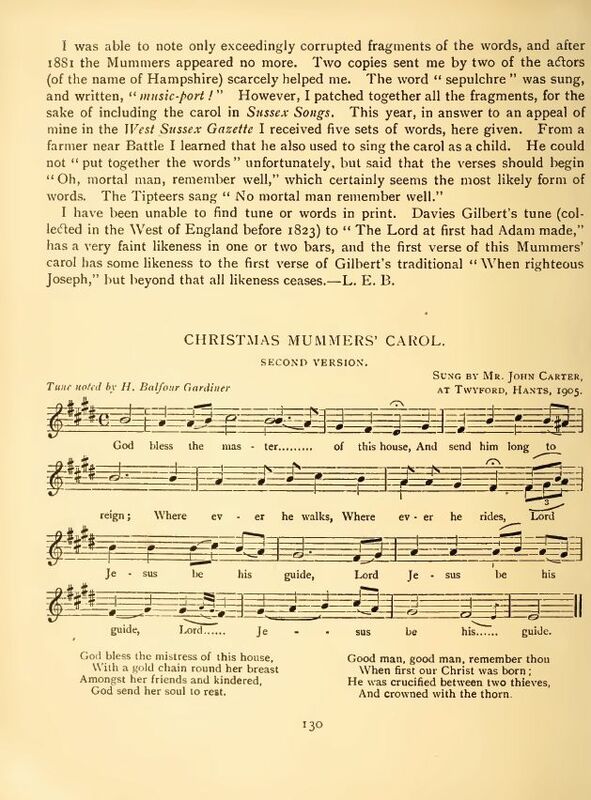 These were patched together by the present editor for the sake of including the carol in Sussex Songs. Fortunately, an appeal in the West Sussex Gazette in 1904 was answered by five village correspondents, who sent versions varying interestingly in detail, but agreeing in the main. From the seven copies this version was selected, as needing only very trifling emendations, which have been made in every case with the help of the other versions. In only one copy is the word “rood rightly preserved to rhyme with “blood”; in other cases the modern word “cross” has been substituted. Three versions have a verse in which the angel addresses the Virgin. In one copy the master of the house is described as having “a gold chain round his waist.” Similar words to a different tune have lately been noted from Hampshire Mummers. 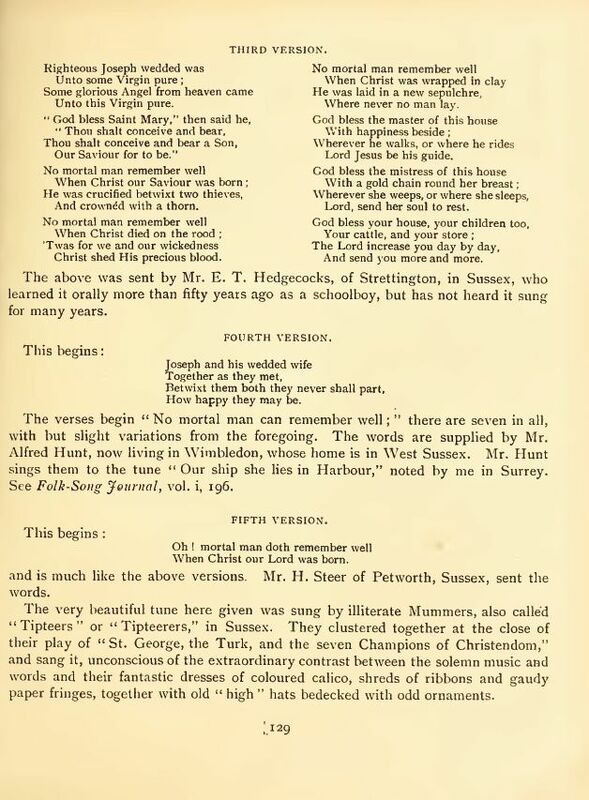 It is worth noting that the surname of the two actors in Sussex who first supplied fragments of the carol words was “Hampshire.” The carol is sometimes sung in Sussex to the tune “Our ship she lies in harbour” (see p. 58 of this collection. For variants and further notes see Journal of the Folk Song Society, Vol. ii., No. 7, p. 128).